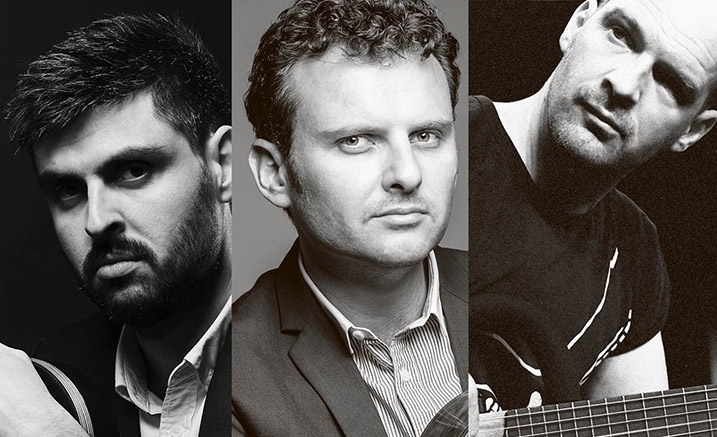 A night of guitar mastery: Slava and Leonard Grigoryan are joined by Wolfgang Muthspiel (Austria), one of the most influential guitarists of his generation. With a repertoire spanning centuries, continents and genres, amazing telepathy and ability to draw emotion from every note, Slava and Leonard Grigoryan are justifiably regarded as Australia’s finest classical guitarists. Wolfgang Muthspiel is one of the most revered guitarists on the world stage. A prolific collaborator, he has recorded and toured with the likes of Trilok Gurtu, Dhafer Youssef, Brian Blade, Rebecca Bakken, Youssou N’Dour, Maria Joao, Dave Liebmann, Paul Motian, Gary Peacock and many others. Bringing diverse influences, stunning technique and risk-taking improvisations – performed on an array of guitars including classical, baritone, 12 string and electric guitar – the Grigoryan Brothers with Wolfgang Muthspiel promises to be a unique musical experience. Please note, due to illness Mr. Ralph Towner has withdrawn from this performance. Leonard Grigoryan will now perform in his place.